The Manpower name and current identity will be retained as on of ManpowerGroup's four main brands. The other brands are ManpowerGroup Solutions, Experis and Right Management, and together they make up a "suite of solutions". Experis is an all new brand, while Right Management is an existing brand which has had a separate identity until now. The new corporate logo and the new division logos seem to be derived from the current Manpower logo, which has five parellel pastel colored bars which form the initials M and P. The ManpowerGroup logo has just four parallel bars, perhaps representing the four main brands. The Martin Agency is credited with helping ManpowerGroup coming up with the new identity. Eurostar is a high-speed rail service which since 1994 has connected Paris and Brussels with London. The symbol from another angle. ﻿Yesterday, March 29, a new identity for Eurostar was unveiled. This has been developed by the London agency SomeOne. This is an immense corporate identity with literally hundreds of different elements. Of course, our eyes are first turned to the new symbol, a shiny lowercase e with a line extending from it. 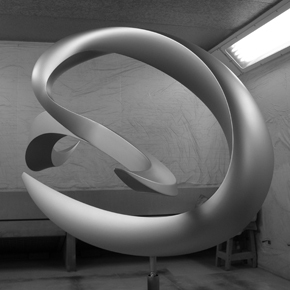 It is in fact a three-dimensional sculpture which can be rendered with many different kinds of texture. In addition to the many metallic iterations, SomeOne have also posted eggshell and marble versions and a grass sculpture. There are also dedicated versions of the symbol for the three travel classes, from brushed steel for "Standard" to gold for "Business Premier", and different marble textures for loyalty schemes. Other tangible elements that have been revealed include an adapted display typeface and a series of pictograms. The new look will reportedly be phased in from April 5. The old identity dates back to the 1990s when the service was first launched. The logo included three lines, representing the three countries Eurostar travels through. The three lines also formed a stylised E for "Euro", and the rebus is finished with a yellow star. The Italian television market is dominated by two companies: Rai, which is owned by the state, and Mediaset, which is owned by the family of Prime Minister Silvio Berlusconi. Those groups own six national networks, which account for more than 70 percent of all viewing. The most prominent challenger to Rai and Mediaset is Telecom Italia Media and its La7 ("La Setta") network. It is however still far from beating any of the six big networks in the ratings. Yesterday, March 28, La7 launched a new look and new graphics created by Red Bee Media. The basic idea with the on-screen look is a little "venue" with the logo at the centre which appears around Italy. You can see a montage of the new look on Red Bee Media's website. The basic shape of the logo remains, although it has been given a slight redesign which is barely noticeable, and a yellow trapezium seems to have become a semi-permanent part of the logo. Polska Jest Najważniejsza (often translated "Poland Comes First", abbrevaiated PJS) is one of several political parties in Poland. It was formed as late as November last year by a splinter group from the larger conservative party Law a Justice, abbreviated PIS. Last Sunday, March 27, the party presented a new logo. It consists of a rising white eagle and the initials against a burgundy square. It was uploaded to the party's Facebook profile the same day. Commercial radio in Sweden has long been various music formats, with a very limited amount of talk-based programming. This will change on April 4, when Radio1 is launched on the airwaves over Stockholm, replacing an adult contemporary station called Star FM. It will broadcast call-in shows, news, discussion and traffic round-the-clock. The station was announced on March 17, and the logo was unveiled on March 24. It is a combination of a lower case R and a 1 numeral. Its design clearly differs from that of other commercial radio logos. Some new entries to Branding Reference added during the last week. The Tunisian postal service - La Poste Tunisienne - has introduced a new logo. The old symbol featured a dove with a globe. It used a lot of purple, a colour strongly associated with Ben Ali's old regime. In the new logo, the purple has been replaced by navy blue and the dove has been replaced by two arches. Union Railway is an enterprise which was launched in 2009 to build a railway network in the United Arab Emirates (UAE), which until recently hasn't had any railways. Yesterday evening, March 23, a new corporate identity was unveiled which renames the company Etihad Rail. Etihad happens to mean "union" in Arabic. The new identity was developed by Brash Brands, a brand consultancy from Dubai. France is divided into 100 departments, and each of them has an assembly called the general counsil (conseil général). One of the smaller departments is Nièvre, whose general counsil recently introduced a new logo. The previous logo was a white "bolt" in the form of an N in a brown and green trapezium. The bolt idea is kept, but now it is orange and has a 3D effect. The typography is all-new. Intertelecom (Інтертелеком in Ukrainian) is a Ukrainian mobile telecom operator. They introduced a refreshed identity on March 21, 2011. Many elements from the old logo have been kept, like yellow and blue colour scheme from the Ukrainian flag and the swirly symbol, which the company calls a "sail". But they have been given a more contemporary look, and the "sail" icon now interacts better with the wordmark which is set in a more modern typeface. The motive has clearly been to value equity and rejuvinate at the same time. The new logo was designed with the Ukrainian creative agency Tabasco. The Tepco logo - a future target for satire? A logo is usually the primary face a corporation. If said corporation does something bad, like destroying an ocean or institutionalizing accounting fraud, the logo will stand in satirists firing line. Do a search for "bp logo" or "enron logo" in Google Images, and you'll find Landor Associates' helios symbol drenched in oil or Paul Rand's slanted E giving you the middle finger. I wouldn't find it hard to believe that the images mocking Tony Hayward or Ken Lay are outnumbered by those that mock the logos of their respective corporation. Because of the ongoing crisis in Fukushima, the management of Tokyo Electric Power Company, who owns the power plant, has faced criticism, although I am certainly not the person to judge whether or not they should be blaimed. If they should, their logo is an easy target for mockery. Tokyo Electric Power Company, who also use the English abbrevation Tepco, has a logo made up of six circles, five smaller ones which form a T and a larger one which surrounds the two circles that make up the "stem" in the T.
For anyone with some time one their hands and a little creativity, it wouldn't be hard to turn it into a mushroom cloud. I have not yet found any satirical images with this logo. I don't know why, but perhaps the country has better things to do than mocking company logos at the moment. Germany has one of the strongest public broadcasting sectors in the world. Together, the public broadcasters ARD and ZDF broadcast over twenty television channels and over fifty radio channels. When they were about to start broadcasting digital television at the end of the 1990s, ARD and ZDF were allowed to start six new digital channels. ZDF rolled out the current affairs channel ZDFinfo, theatre channel ZDFtheaterkanal and documentary channel ZDFdoku. Lately, ZDF have overhauled their digital channels, starting with the documentary channel which became youth channel ZDFneo in November 2009. Next in line is the theatre channel which will be relaunched as the cultural channel ZDF.kultur on May 7. Last week (March 14 or earlier), the logo and identity for the channel was presented to the media. The orange colour links back to ZDF's main channel, while the typeface gives the channel its own character. The on-air look has been created by the Munich broadcast design agency Luxlotusliner. CommScope is an American company which manufactures various telecommunication infrastructure products, including wires and antennas, based in Hickory, North Carolina. Last Tuesday, March 15, the company unveiled and launched a new corporate identity. The previous logo was introduced in the 1990s, probably when the company was spun off from General Instruments in 1997. The new logo has the company name in all capital letters, with the last O replaced by the company's new icon, a cyan blue orb with a whirl. The previous logo featured a somewhat similar icon, a teal oval with a stylized representation of a cable. This is has intentionally been made less obvious in the new icon, as the company is no longer a simple cable manufacturer. The orb can be used on its own without the logotype. There are also three versions of the orb that have been created to represent the company's markets segments: At Home, At Work and On the Go. Bhutan is a small country located in the Himalayas between India and China with about 700,000 inhabitants. Recently, the Tourism Council of Bhutan launched a new logo to promote tourism to the country. Some reports say the logo was presented on March 10 at a travel fair in Berlin. A new slogan was also launched, "Bhutan, Happiness is a place". The new logo consists of the slogan and a water color rendering of a blue poppy, Bhutan's national flower. It was created by Ogilvy and Mather in India. Over week ago, it was reported that the open source web browser Chromium was about to get a new icon, a flattened version of the previous glossy 3D model colored in shades of blue. Chromium is the attic cousin of Google's web browser Google Chrome, which uses a similar icon, but instead of a blue it is coloured with Google's signature colors. It was quickly assumed that Google Chrome would be getting a similar icon makeover. If Google didn't release the new Google Chrome icon themselves, mock-ups and fake versions of varying quality would inevitably start spreading on the web. I haven't seen any official use of the new icon myself, but an increasing amount of sources are now reporting limited use of the logo above by Google Chrome. Hopefully, this will be confirmed by an official Google source soon. Update: Cnet are reporting that the new icon was introduced on March 15 and that the logo was first used with a developer release called Chrome 11.0.696.12. NOMOS Bank (Номос Банк with cyrillic letters) is a major Russian bank. Yesterday, March 14, it announced that it is rebranding itself with a new look to change the perception of the bank and ensure people of its financial stability. At the heart of the new look is a new symbol, the initials N and b in an underlined blue rectangle. Following a common trend, the initials are written with the latin alphabet instead of the Russian cyrillic. The symbol is usually accompanied by the full name, which can be written with either latin or cyrillic letters. The new look was created by Zoran DesignWerkBüro. The logo can already be seen on the company's website, and it will be rolled out branch offices over time. The will also be an advertising campaign. Last week, on March 10, Peru launched a new brand to promote tourism and investment in the country. It was created by FutureBrand. The logo consists of the word Perú with an accent mark over the u, as in the Spanish spelling of the name. The P is stylized as a large spiral, inspired by ancient settlements in the country. The logo is usually shown in white on red background, the colors of the Peruvian flag. The logo can also be used with blue, green and purple background, and there is also a version the mark in red on white background. A custom made typeface called Bree Peru has been created by TypeTogether. The logo can be used both as a tourism logo and as a tag on Peruvian export products. Last Friday, the entrance to the New York Stock Exchange was draped with the logo during "Peru Day". 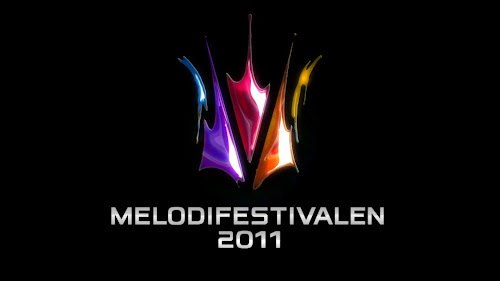 Melodifestivalen ("The Melody Festival") is a Swedish annual music competition, and the most watched television programme in Sweden. The final is usually watched by 3-4 million people, in a country with 9 million inhabitants. The show has been broadcast by the state broadcaster SVT almost every year since 1959, and today much of the Swedish mainstream music scene revolves around this event. When the show for 2002 was planned, the event's popularity had slipped and SVT felt that the programme needed to be re-tooled. SVT extended it from one single Saturday night broadcast to five events which would take place around the country for more than a month. The show would also get a consistent look and feel. Before 2002, new graphics and identities were produced every year. SVT turned to broadcast design agency Dallas Sthlm who developed a new generic logo and new graphics for the event, which would be used every year after that. The logo is made up of five spotlights which form a crown. This logo and graphics package has remained with some updates until the 2011 competition, when it was time to create a new look. This was probably partly due to the show's long overdue switch to HDTV. SVT once again turned to Dallas Sthlm, who suggested a makeover of the logo and the graphics (archive). The previous graphics were based on lights, the new ones feature fluid shapes. This can be seen in the new logo, which kinda looks like someone threw slime on a wall. Overall, the new look is familiar if you've seen the old one, but has an edgier feel to it. Nenets Autonomous Okrug (Ненецкий автономный округ in Russian) is one of several "federal subjects" that make up the Russian Federation. Located in the arctic region, it has a large minority of indigenous people. Recently (March 2 or earlier), Moscow design agency Notamedia published a new corporate identity they have created for the region. The logo contains a symbol made up of squares with rounded corners which contain four icons, inspired by traditional indigenous art. Similar shapes can be found in the region's flag and coat af arms. They represent a tent, a pair of antlers, a fish and a drop of oil for the region's crude oil production. Notamedia have also created a bunch of patterns and figures based on the squares in the logo. The region also has a new slogan, which translates roughly as "Nenets Autonomous Okrug - The North European pantry in Russia". Euroset (Евросеть with cyrillic letters) is Russia's largest retail chain for mobile communication equipment (primarily mobile phones). Russian newspapers say they have over 4,000 locations. Today, on March 10, they unveiled a new identity. It was created by Wolff Olins, who have previously created several high profile corporate identities in Russia, such as the MTS egg logo. 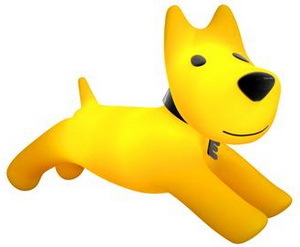 The new symbol for the chain is a cute yellow terrier, a symbol assoicated with trust, loyalty and friendship. The yellow colour has survived from the previous identity, but is slightly warmer. The identity also uses sky blue and white. The logo itself is a simple wordmark, usually shown in white on yellow background or black on white background. The old logo has reportedly remained with only minor changes since the company was founded in 1997, and is considered a bit dated, which isn't something a store which sells quality hi-tech products should be associated with. Australian Radio Network is a company which operates several radio stations in Australia. It is a joint venture between local media group APN News & Media and Clear Channel International. A few days ago (March 7 or earlier), they launched a new logo. The new logo is credited to the agency The Creative Method. Is this logo dear to you? Does it evoke special feelings? If that is the case, then you better start writing your eulogies, because it will soon disappear. DnB NOR is the largest financial services company in Norway, formed in 2003 through the merger of Gjensidige NOR and Den norske Bank ("The Norwegian Bank", abbreviated DnB). Recently, Norwegian media have reported that the bank will drop "NOR" from its name, and that the name DnB (or Den norske Bank), will soon stand alone again. A simpler, bolder and more powerful name than before. The renaming also comes with a new logo, expected to be revealed this year. The logo for the 2003 merger between (the old) DnB and Gjensidige NOR was created by taking the type from the old DnB logo and adding the name "NOR" after it in the same typeface, but in Gjensidige NOR's old red-ish burgundy colour. If one adds a white background colour to DnB's blue and NOR's red, you get the basic colours of the Norwegian flag. The merged bank was launched on December 5, 2003, and the logo was launched at the same time. The agency behind the merger logo was Scandinavian Design Group, a major Norwegian corporate design agency. Scandinavian Design Group was also behind a logo refresh for DnB less than two years before the merger, when the typeface was changed and the number of lines that made up the circular symbol in the logo was reduced. Every month, Strasbourg becomes the capital of the European Union for one week. Because of this, Strasbourg moved its website from the Strasbourg.fr domain to Strabourg.eu, using the new Internet domain for the European Union. In 2010, Strasbourg also started using a new logo which incorporates the Internet domain. The name is written in a sans-serif typeface (probably Avenir Heavy), with the exception of a and the g, which are shapely serifs (probably Bodoni). I have no idea what the symbolism might be, if there is any. The logo is usually presented against warm background colours, and the wordmark is mostly white, with the exception of the .eu part which takes a slightly brighter shade of the background colour. The new logo doesn't use any symbol at all, making Strasbourg one of few French cities to use only a wordmark as its logo. 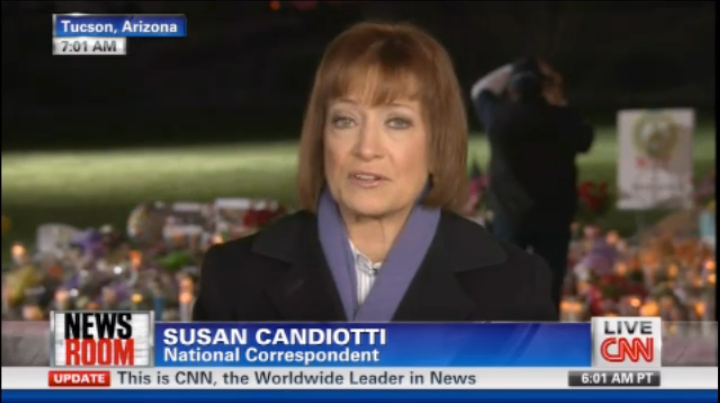 Gannett - which is pronounced with emphasis on the last syllable, like cadet - is a big media conglomerates in the United States. It owns over 90 newspapers, most notably USA Today, and about two dozen TV stations. On Monday, March 7, 2011, the company is launching a new look. The logo had already been published by some news outlets on March 4. The new logo simply consists of the name written in Verlag typeface, sometimes with the slogan "It's all within reach" underneath. It was created by an advertising firm called The Farm. The previous logo contained a globe which was partly covered by a G. It has been in use for decades; I haven't been able to pinpoint when in was introduced, but it was probably born in the 1970s. Update: According to Gannett, the old logo was commissioned from Mutsuo Yasumura & Associates after the 1978 merger with Combined Communications. It was first used on the 1979 annual report, and came with the slogan "A World of Different Voices Where Freedom Speaks". Dressmann is a Norwegian retailer of men's clothing. Starting in Oslo in 1962, the company has expanded to all Nordic countries as well as Germany and Latvia. The chain is known for modest clothes of good quality to modest prices. In January 18, the company announced that its was rebranding itself, including the adoption of a new markteting strategy and a new logo. Dressmann have entered an exclusive agreement with the Rolling Stones, which can be noticed throughout the marketing. Stones songs can now be heard in the stores, which are being rebuilt to look like concert stages. Dressmann has an ongoing ad campaign with Rolling Stones theme, and lincensed T-shirt can be bought in the stores. With the relaunch, Dressmann have also officially launched a new logo. It had already been sighted on some storefronts, but the Janaury 18 announcement made it official that it was replacing the old logo. Dressmann trialled a similar logo over a year ago, although it was all lower case and used a slightly different typeface. It wasn't seen on Dressmann's website or in marketing, but has been used on storefronts and clothing tags. Podkarpackie, or Subcarpathia, is a province in south-eastern Poland. On February 28, the local assembly decided on a new logo to market the region. It was created by Krakow agency Demo. The symbolism in the logo is commonly used. We have a green elements to represent local nature, and a blue arrow to represent the air and freedom. An agreement has reportedly been reached with Ryanair to display the new logo on their aircraft. Subcarpathia also has a new slogan, "Przestrzeń otwarta", which approximately means "Open space". Tourcoing is a city located at the very north of France, near the Belgian border in the Nord-Pas-de-Calais region. It launched a new visual identity in September 2010. It was credited to the French agencies À Propos and MB Design. The previous logo was a modern interpretation of the classic coat of arms. The new logo keeps the most important parts of the coat of arms; the cross and the five bezants (medieval Byzantine gold coins). The cross has been transformed into five squares and is now black. The four additional grey square are probably inspired by the coat of arms, where the blazon dictates a silver background. Because of the financial crisis, several banks have been hit hard. This includes Spain's local savings banks, which has lead to an effort to merge them and turn them into regular banks. One such merger happened on December 3, 2010 when Banco Financiero y de Ahorros S.A. was created by seven savings banks. Caja Madrid is the dominating partner in the merger, the others are Bancaja, Caja Insular de Canarias, Caja Segovia, Caja Laietana, Caja Rioja and Caja de Ávila. Yesterday, on March 2, the brand to be used by the new enitity was unveiled and launched. It will be called Bankia. Interbrand was involved in all aspects of the corporate identity, including choosing a name and creating a visual profile. The name Bankia has several values in it. It is international and works in many languages, and it includes a K from the English spelling of the word "bank". The typography in the wordmark also has many interpretations. For example, the merged N and K respresent integration. The dark brown and yellow-ish limegreen colours are modern interpretations of colours traditionally used by savings banks in Spain. Bankia have posted a beautiful Youtube video which explains the changes. CS Link is a satellite television platform which broadcasts to the Czech Republic and Slovakia. It unveiled a new logo yesterday, March 1. The logo consists of the name in white on an egg-shaped oval with a "fresh orange-red shade". Deichmann is a European shoe retailer. It originated in Germany, but has expanded to over a dozen different countries. For several years, its logo has been a D in a square with a shoe. On February 1, the chain unveiled and launched an updated version of that logo. The new logo removes the shoe and the blue background behind the green square. The D still has an irregularity where the shoe used to be. I imagine that the D has been "worn in" through the years, the same way a good pair of shoes shapes itself after your feet. The new look was created by KW43 in Düsseldorf. Bridgestone, the multinational tire company, unveiled and launched an updated logo today, March 1. According to the company, the previous logo was introduced around 1984, and the new one isn't a radical departure from it. The clunky typeface is changed to a more modern one. The B icon gets rounder shapes. Bridgestone also gets a new tagline, "Your Journey, Our Passion". The previous one was "Passion for Excellence". Companies who work with pulp and paper rarely use those words to describe themselves. One such company is the Finnish Ahlstrom which calls itself as a "high performance materials company". Ahlstrom revealed a new brand identity on February 28. The new identity was created by the London office of Dragon Rouge. The previous logo was adopted a decade ago, most likely in 2001. It contained an clever icon which was a stylised version of a tree. That identity was created by (archive) the Helsinki agency Porkka & Kuutsa. This was based on an earlier logo which contained an actual silhouette of a tree. The the Volkswagen-owned Czech automaker Škoda Auto recently announced that it was going to reveal a new logo for the International Motorshow in Geneva. Škoda have kept a lid on it until yesterday evening (February 28), when the new corporate identity was unveiled. The new logo removes the name Škoda Auto from the outer ring, à la Starbucks. The winged arrow is now more prominent. The green colour of the figure has changed from "natural green" to a new tint called "Škoda green". A new logo has been floating around on the Internet at least since November last year. It had the winged arrow symbol in white on a green circle with a blue border. I don't think that logo was ever confirmed by Škoda. According to Škoda, the winged arrow dates back to 1926, and the previous design is from the 1990s. On the morning of this January 10, CNN launched a new look for its US channel.